The “Jira search” entry searches my company’s local Jira server. 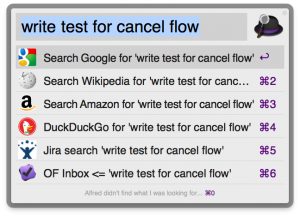 You can add one for yourself by clicking this link and editing the URL in Alfred Preferences | Features | Web & URL | Custom Searches (this is in Alfred.app version 1.3.1). 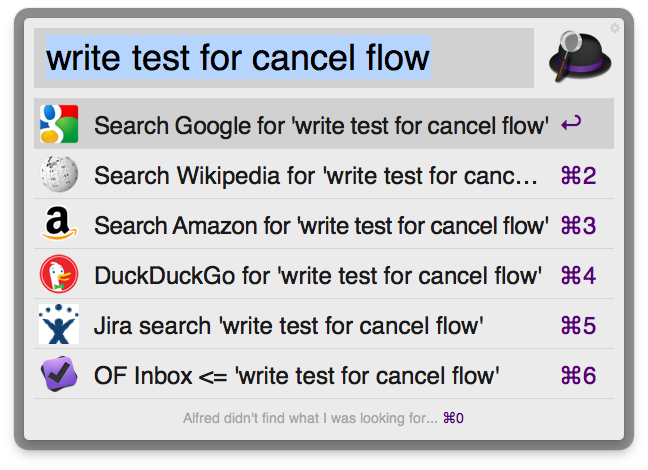 The “OF Inbox” entry uses an omnifocus:// URL to send the text to your OmniFocus Inbox. Here’s a link to add this to your Alfred config.